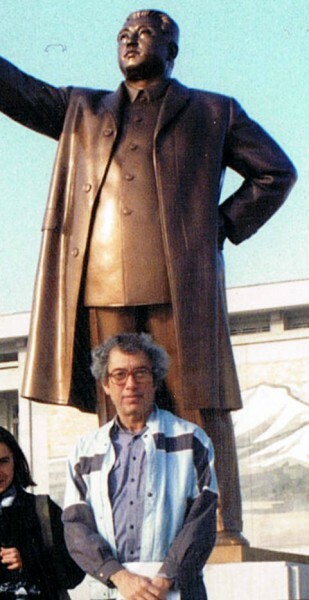 Kim-Il Sung and Harry Rolnick. Unlike a certain monarchy I know of (hint: it’s just north of New York), we Americans have democracy, and the first week of November, we will have voted for somebody to be our leader. But not our Dear Leader or Beloved Leader. Just a plain ordinary Leader. Which brings me to the heartland of Unending Beloved, Great and Really Terrific Great Leaders of Freedom. Specifically, the People’s Democratic Republic of (North) Korea (DRK), a country in which I spent 10 days 18 years ago. Unaware of the desperate economic situation at that time, I intended to pursue some mano-on-mano conversations. My guide, a garrulous, perfectly bilingual guy named Kim, was happy to provide me verbal stimulation. Whatever the challenges, Koreans have grown up in a universe that could have been created by Gilbert and Sullivan or Franz Kafka. Let us return to democracy—American democracy vs. North Korean democracy. Kim assured me I didn’t have the foggiest idea about freedom. Kim glared at me, and gave his mantra. “No. You are free one day a year, in November. For 364 days, you are ruled by corrupt, rich, terrible people. We were dong a little after-dinner drinking. He was sipping from smuggled Red Label Scotch. I was drinking the local so-jiu. We became more animated, but it was never personally hostile. At one point, Kim became downright metaphysical in his reasoning. In sum, it was his crumbs of Hegel-Thought vs. my crumbs of Bagel-Thought. He was using Oxford Union logic against my instinctive feeling that I knew what was correct. He squinted, shook his head and smiled at my naiveté. This time he smiled without disdain, but because I finally had gotten the point. I started to chide him, that capitalist Korea (“the one in the south”) had many, many roads, while his Korea had only a single highway. He was pleased to tell me how the DRK could make the world a merrier place. I needed some potent Korean rice wine, he had a new illegal shipment of capitalist bourbon. And the two of us spent the evening in mutual silliness. Be the first to comment on "The discovery of truth and freedom, North Korean style"